Aaron Hernandez was diagnosed with CTE, but only through a postmortem examination. Researchers hope to be able to diagnose CTE in the living. Boston University researchers have moved closer to identifying a way to diagnose chronic traumatic encephalopathy, or CTE, in the living — a step forward in learning about the incurable brain disease, which has afflicted countless athletes and members of the military. In a study published Tuesday, the BU team reported that it had found a protein in spinal fluid that might indicate the presence of CTE. Currently, the disease, linked to repeated hits to the head, can only be diagnosed after death. “I feel like we’re turning a corner here and really moving closer to a solution,’’ Dr. Ann McKee, the paper’s senior author, said in an interview. The findings were published in the journal PLOS One. BU researchers have found CTE in more than 110 deceased National Football League players, including former Patriots star Aaron Hernandez, who hanged himself in April at age 27 while he was serving a life sentence in prison for murder. Dozens of other athletes in sports ranging from ice hockey to baseball have been diagnosed with CTE, as well as military veterans. McKee, who is a director of BU’s CTE Center and chief of neuropathology for the VA Boston Healthcare System, said the findings are preliminary and have yet to be verified. But even as she estimated that it may take another five years to develop a reliable test for CTE in the living, McKee said she was heartened by the discovery. She has dedicated most of the past decade to diagnosing CTE in the deceased. Many of her subjects were former athletes whose lives were ravaged by the disease. Some, like Hernandez, committed suicide. The campaign to prevent and treat CTE has gained urgency as numerous studies have linked repetitive head impacts to short- and long-term brain damage. A BU report published last week found that playing tackle football under the age of 12 may expose children to repetitive head blows that double their risk of developing behavioral problems and triple their chances of suffering depression later in life. For the study published Tuesday, researchers from the BU School of Medicine and VA Boston Healthcare examined the brains of 23 college and professional football players and compared them to the brains of 50 nonathletes with Alzheimer’s disease and a control group of 18 nonathletes. All the subjects were deceased. Researchers examined frozen brain tissue and cerebrospinal fluid. 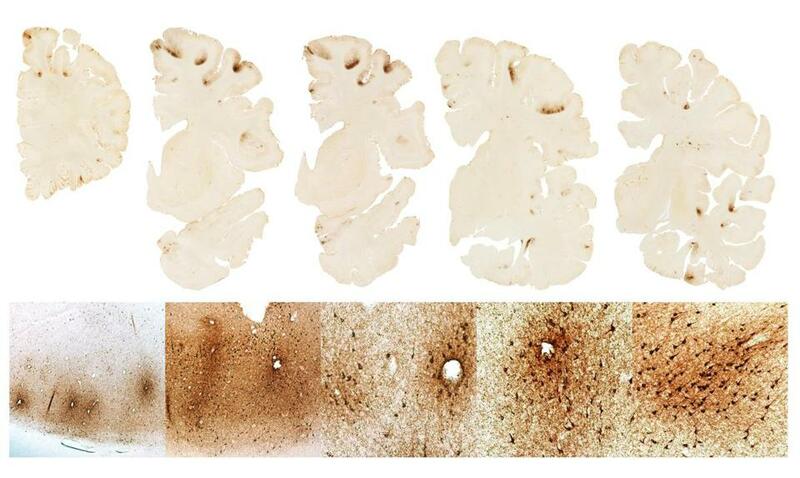 The BU team said it had discovered a new biomarker for CTE. The study found that levels of the biomarker, known as CCL11, were normal in the brains of the nonathlete control group and nonathletes with Alzheimer’s. But the levels were significantly higher in the brains of individuals with CTE. Researchers also compared the degree that CCL11 was elevated in the deceased football players to the number of years they played the sport and found a positive correlation between the CCL11 levels and the number of years they played. The study suggests that the new biomarker may also help distinguish between CTE and Alzheimer’s disease, whose symptoms often are similar. The authors said additional studies will be necessary to gauge whether increased CCL11 levels might help predict the severity of an individual’s disease. The goal then would be to come up with treatment options. Dr. Sam Gandy, professor of neurology and psychiatry at the Icahn School of Medicine at Mount Sinai in New York, said he was “very enthusiastic” about the BU team’s findings, but he cautioned that it can be tricky to distinguish CTE from Alzheimer’s. A hallmark feature of Alzheimer’s is the presence of amyloid plaques in the brain — but some people with CTE also have amyloid. Gandy said he would have more confidence in the findings if the results separated people with CTE plus amyloid from those with CTE but no amyloid. Further, Alzheimer’s itself has so far eluded a medical remedy — demonstrating the immense challenges in treating brain diseases. In the absence of a treatment to reverse CTE, merely getting a diagnosis would not change the care a patient would receive, Alessi said. A CTE patient would be offered cognitive-behavioral therapy and medications, just as happens today for people who develop an explosive temper, mood swings, or the other emotional problems associated with CTE. One of the serious cases of CTE involved professional wrestler Chris Benoit, who was diagnosed with the disease after he murdered his wife and their 7-year-old son and killed himself in 2007. Researchers across the country have joined the effort to find a way to diagnose the disease in the living. The BU team is participating in a $16 million, long-term study, funded by the National Institute of Neurological Disorders and Stroke, aimed in part at achieving the goal. Felice J. Freyer of the Globe staff contributed to this report. Bob Hohler can be reached at robert.hohler@globe.com. Felice J. Freyer can be reached at felice.freyer@globe.com. Follow her on Twitter @felicejfreyer.